His works preview on this site in gratitude for his and Howard Wexler's students who taught me the basics during high school. Rancho De Taos, New Mexico"
Limited edition print on watercolor paper with a run of 1000. This fine quality offset color lithography produced at Starline Printing in Albuquerque, New Mexico in the mid 1980s. The original oil painting is (in the Maroger Medium), 46” x 32”. 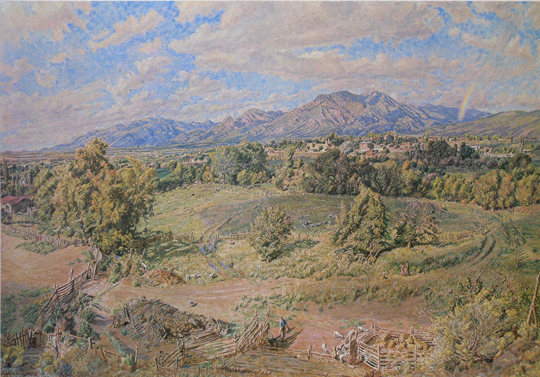 This painting which took the artist several years to accomplish, portrays the Ranchos de Taos village – in its unique, immense landscape setting, which the artist considered inseparable from one another. Equally as important as the structural aspect of this work is the sensitivity to the Autumn season, time of day and weather conditions. The print bares the signature with painting dated 1978. Image size is 30" x 20.5" with paper dimensions 34" x 24". Limited edition print on watercolor paper with a run of 1000. This fine quality offset color lithography produced at Starline Printing in Albuquerque, New Mexico in the mid 1980s. The original is watercolor on watercolor paper and the print bares the signature with painting dated 1983. 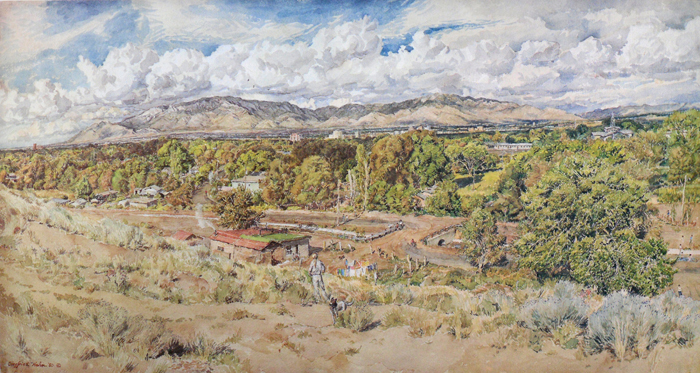 Painted from Albuquerque's undeveloped west side (at the time), Hahn's careful hand for details and broad scope for landscape panorama entices the viewer's eye up and down the Rio Grande valley. Below billowing clouds, the Sandias rise into the vast stretching New Mexico skies. The image size is 23" x 12.5" with paper dimensions 26" x 16.75". Limited edition print on watercolor paper with a run of 1000. This fine quality offset color lithography produced at Starline Printing in Albuquerque, New Mexico in the mid 1980s. The original is watercolor on watercolor paper and the print also is on watercolor paper baring the signature with painting dated 1983. 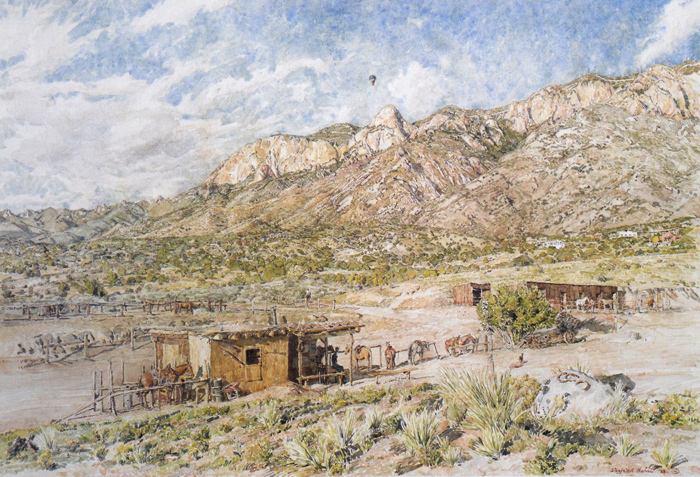 Painted from the base of Albuquerque's Sandia Mountains in 1983, Hahn's careful hand for details and broad scope for landscape panorama entices the viewer's eye along dirt trails, arroyos and the steep mountain face. The Sandias rise into the vast New Mexico skies. Image size is 20" x 13.5" with paper dimensions 24" x 18.5". A must have for those who love the old masters approach to painting and American landscapes with an old west flair. $10-15 for UPS or FedEx ground services. Rural deliveries incurr additional $5. Seigfried Hahn (1914-2008) a worldwide recognized painter of portraits and landscapes, was born in Randfontein, Transvaal, South Africa. He became and American citizen in 1973. Hahn was very dynamic and disciplined in his approach to realistic portraits and landscapes as well as in his art instruction. Possessed exceptional knowledge in the techniques of the Great Masters in oil painting, in evidence in his own work as well as imparted with lucidity to students. An extensive article on his approach to drawing and painting appeared in the March 1976 issue of American Artist Magazine. Acquainted through a six year correspondence with Jacques Maroger, Director of the Louvre Laboratories in Paris, Siegfried acquired and shared the Renaissance Masters’ detailed methods and recipes for the Venetian and Flemish mediums used by the great masters in their oil painting. The Venetian medium adds beeswax with the oil to give the painting a satiny glow and suppleness as seen in works of El Greco and Titian. The Flemish medium mixes mastic resin to the oils to give a jewel-like, freshly-painted brilliance as seen in works by Rubens and Rembrandt. Turpentines, siccatives or varnishes are never needed, as they tend to evaporate the oil from the oil paints leaving a finished painting looking “dried out” and brittle, or a varnish that yellows with age. Hahn exhibited in one-man and group showings in Great Britain, Belgium, Holland, Czechoslovakia, Denmark, Norway, Finland, Portugal, France, Germany, Italy, Spain, Greece, Turkey, Austria, and the United States. His paintings enhance numerous public and private collections throughout the world.